Where we live, crocuses and forsythia are the very first flowers to bloom as winter transitions to spring. That happens to be the best time to put up a mason bee nest, and this year we’ve tried our hand at it. Mason bees are small plant pollinators like the familiar honey bee, but they are solitary and do not produce honey. With no hive or honey to protect, they virtually never sting (unless extremely provoked) and are safe to be handled gently by children. Mason bees use nests to raise their young. Although they live alone, they happily lay their eggs in cavities near fellow mason bees in miniature human-made communes. Mason bees are considered true “natives” in North America (as are similar bees around the world). By comparison, honey bees—thought to have originated in Asia and cultivated in Europe and Africa since ancient times—are rather recent arrivals to North America (1620’s) and Australia (1820’s). Here's a mason bee nest at our local nature center. You can see that the bees use mud to seal in their eggs into the nest holes, where they will mature into adults and eventually emerge to greet the world. You can buy mason bees by mail-order and for the past few years we contemplated doing this. However, you must place your orders in the fall (breeders quickly sell out). Plus, we know that mason bees live in our area because we’ve seen their active nests at a local nature center (see photo above). You can also buy nests, but we’ve learned that they should be replaced at least every two years—if not annually—because they quickly become infested with fungus and mites that kill the growing bee larvae. Adult mason bees can then carry these pests to new nests and spread the problem. So, it seemed more logical to make our own nest from found materials, and to hope that local mason bees would find their way. We scavenged a large chunk of an old fir tree on one of our neighborhood walks for our nest. 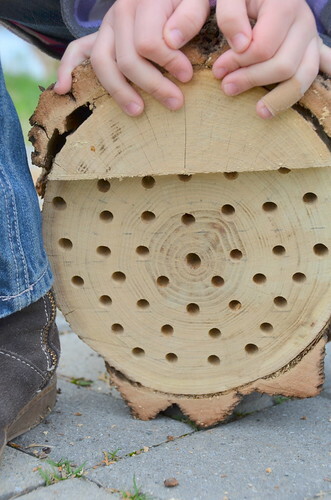 Below are instructions for making and installing your own mason bee nest. There are lots of tutorials around; here, I’ve distilled the best of them. 1. When choosing wood for your mason bee nest, select wood that isn’t treated and avoid aromatic wood such as cedar. Our bit of fir tree is 7 1/2” x 8” on its face and 7” deep. A 7” deep block of wood (4” wide or wider) will work fine. 2. Mark holes for the nest cavities, setting them about 1/2” apart. Drill holes(do not drill all the way through). The ideal hole width is 5/16” (8 mm). The ideal depth for a cavity is 6” deep. Unfortunately, standard drill bits only drill holes 3” deep. You can try using 3” holes, as some suggest, although shallower holes tend to produce far more males vs. females. I opted to make 6” holes. 3. 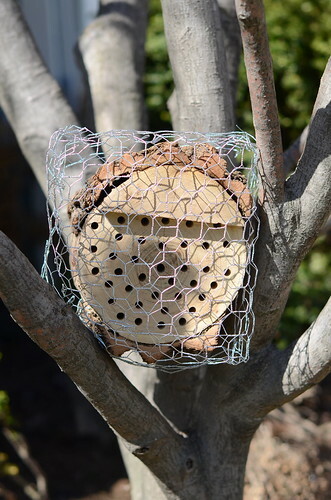 When you’re finished drilling, cover the front of the nest with chicken wire (I used two overlapping rectangles nailed down to the sides, creating a “bubble” an inch or two away from the nesting hole entrances). This keeps out the birds and squirrels. 4. Consider nailing a shingle as a sloping “roof” to direct water away from the entrance to the cavities. We sawed some wood away to create a one-inch “awning.” You can also place your nest under an overhang for additional protection, as we’ve chosen to do. 5. Mount your finished nest (on a post, fence, or building) facing south and avoiding direct sun. 6. Do not spray insecticides near your mason bee nest. 7. Mason bees need mud to seal their eggs in the nesting holes. We’re keeping a bit of garden bed near our downspouts moist from now until fall so our bees will have mud for their nests. 8. Last, you’ll need nearby flowers to attract and keep mason bees. But that was why you wanted them in your garden in the first place, right? If you are amateur mason bee keepers like our family, set the nest up and then keep it undisturbed for a year or two. Then take the nest down and discard it. We’ll make a new one again in late winter another year if all goes well ~ we’ll let you know if we manage to attract any mason bees to our garden. You may be more ambitious than we are, in which case you may want to line your holes with parchment paper, harvest the nests in November and store them in the fridge. Take a look at this PDF link to learn more.